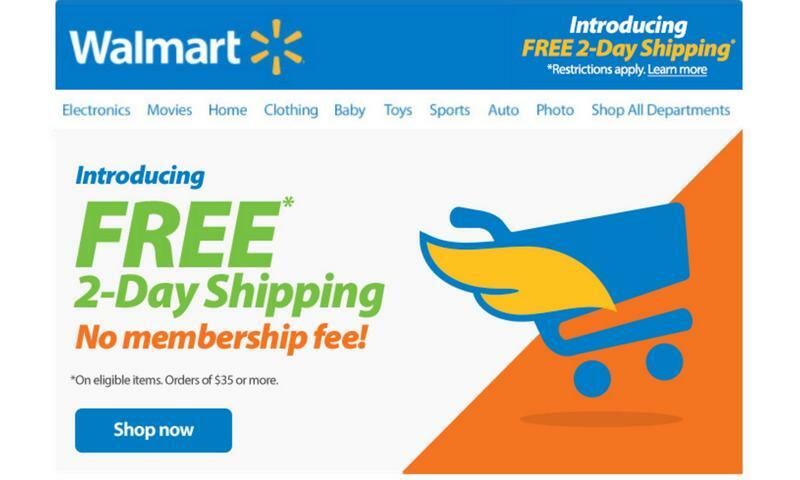 Walmart on Tuesday announced that it will now offer all of its customers free two-day shipping providing they spend at least $35. The move further aligns Walmart's business with Amazon, which offers free two-day shipping for its Amazon Prime members. Previously, Walmart offered free shipping to customers who spent at least $50 in stores and who paid for a ShippingPass membership with the retailer. Customers can also order items shipped to a nearby store, instead of to their homes, for free. There are some small caveats, however. Walmart's shipping policy doesn't apply to everything the store offers. "Walmart's free two-day shipping will be available on the items customers shop the most, including household essentials such as baby necessities, pet products, food, like cereal and peanut butter, cleaning supplies and beauty favorites, as well as top electronics and toys," Walmart said. That sounds like a good bulk of the items most folks head to Walmart for anyway. "I couldn't be more excited. We are moving at the speed of a startup," said Walmart US eCommerce president and CEO Marc Lore said. "Two-day free shipping is the first of many moves we will be making to enhance the customer experience and accelerate growth." Customers should find the new free shipping option available now.